Flutter FETTI Confetti Makes the World a Happier Place! Whether you’re celebrating a holiday, a wedding, or a graduation, or producing a concert and need a spectacular finale, our beautifully cascading tissue FETTI is a surefire way to up the excitement! Our bulk tissue confetti is available in a wide variety of color options, giving you the freedom needed to color coordinate your tissue order perfectly with your party’s color scheme. Most of our custom color confetti options can be previewed here, but we also carry fun neon "glow" in the dark tissue in pink, green, and white. If you’re interested in including one of our neon colors into your bulk order of custom color confetti, please contact us for pricing. All of our bulk Tissue Flutter FETTI is flame-retardant, biodegradable, and packaged loose in a 1-lb poly bags or any way you want it packaged. We also can mix the FETTI colors together and package in larger quantities including 5-lb. and 10-lb bags (and up!). Put the Bulk Tissue Flutter FETTI Confetti into the Surprise Box then wrap our Surprise Box Continuous Flow Confetti Launcher in birthday, baby shower, corporate logoed paper or wedding wrapping paper. Turn on the 5lb liquid siphon Co2 tank which comes with the Surprise Box but you need to get it filled with Co2 in your hometown. Then take the hook, pull up the lid of the Surprise Box and the confetti products inside will fly up and flutter all around. The crowd will go wild when you use our 3" or 6" Continuous Flow Confetti Gerb Launchers! This option is perfect for large venues including concerts and sporting events. By dropping handfuls of bulk tissue or metallic Flutter FETTI or a combination of both into the hopper of the Gerb, the 3” Continuous Flow Gerb will shoot 1-lb of Flutter FETTI product 75 feet into the air per second and the 6” Continuous Flow Gerb will shoot 1-lb Flutter FETTI products 100 feet into the air! Pair it with our Red Blower Confetti Launcher, which will shoot your confetti 40 feet in the air. This option is ideal for events in a smaller venue. Flutter FETTI’s mission is to bring excitement and joy to every special event in your life! Contact one of our Confettiologists and we’ll make the right product recommendation to add the “WOW!” factor to your celebration. 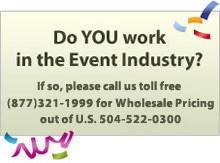 Do you work in the event industry? Contact us for wholesale pricing. Make your next event magical and memorable with Flutter FETTI! Some Flutter FETTI tissue when saturated with any liquid and under pressure may bleed color and Flutter FETTI® cannot guarantee or warranty that it will not do so. If any liquid will or may be present at an event, please consult with us so we can assist you in choosing water-safe FETTI® products.